Cilantro is also known as coriander leaves or Chinese parsley. Its seeds and leaves are used as a seasoning condiment hence it is considered both a spice and a herb. Cilantro bears strong resemblance to Italian flat leaf parsley with the latter having less fragrant or smell. Both belong to the same family Umbelliferae. The leaves of this herb should look vibrantly fresh and deep green in color. They should be crisp, firm and free from yellow or brown spots. It has a strong smell that you either love or hate. 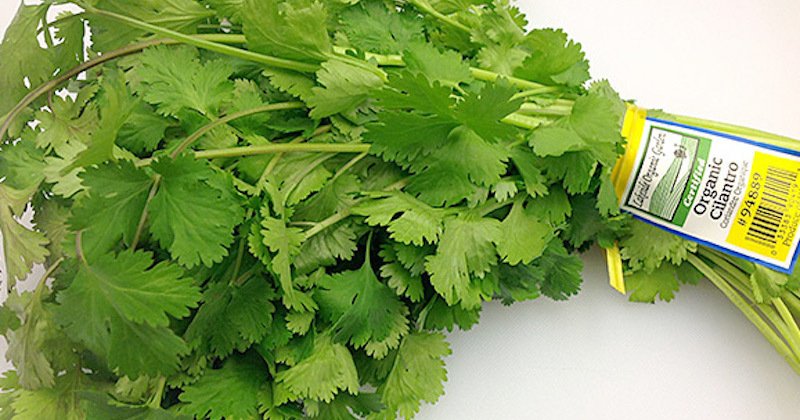 Cilantro is full of an unusual array of healing phytonutrients and antioxidants. Its leaves and seeds contain some amount of various essential oils that makes this herb useful for use in traditional medicines. It is antiseptic, analgesic, aphrodisiac, helps with digestion, fungicidal and a natural stimulant. Antibiotic properties: An antibiotic compound, dodecenal, was isolated from cilantro and tested in the laboratory. The impressive result showed that it is twice as effective as the commonly used antibiotic drug gentamicin at killing the food-borne bacteria, salmonella. Anticancer: The anti-oxidant properties from cilantro include beta carotene, vitamin C and E, ferulic, caffeic acid, kaempferol, and quercetin. This broad spectrum of anti-oxidant helps to lower the risk of oxidative stress in the cells that are carcinogenic (cancer-causing). Antimicrobial properties: Cilantro contains volatile oils that have antimicrobial properties, making it a very useful herb that can be used for fungal, bacterial or yeast infections. Heavy metal detox: Cilantro is one of the very few herbs that is used as a heavy metal detox agent, to detoxify mercury, aluminium and lead among others. Eating cilantro or drinking its juice regularly helps prevent Parkinson’s and Alzheimer’s diseases. Immune booster: The presence of antioxidants, rich phytonutrients, minerals and vitamins in cilantro all work synergistically to boost the body’s overall immunity system against infection. How to store: Wrap cilantro (still with the roots) loosely in a piece of newspaper to keep it free of moisture. Put in a plastic bag and store in the fridge to preserve it for a longer period of time. When stored properly, it can last for up to a week. When you want to use it, remove it from storage and soak in a bucket of clean water for about 10 minutes for it to revert back to its crisp state. Cilantro is best juiced using a masticating juicer, especially with the horizontal gears. Here’s a juice recipe that I like to use for heavy metal detox/cleanse. Also read about heavy metal poisoning and heavy metal detox drink.